Metric: Black blades. Yes I know that's an ill omen with previous careful owners. Fortunately I listen to Blue Oyster Cult - forearmed is forewarned? Overall: 4 black blades (good work despite mild case of multiclassing). A decent analysis of the magus and provision of additional options for it. The feats are good (some show in other Advanced Feats books) and emphasise magus strengths. The builds depend on multiclassing in two cases out of three. More use of the archetypes in Ultimate Magic would have showcased the magus without the need to relentlessly optimise. The analysis of the magus is solid, considering the main benefits and limits that the class has to offer, though the mention of archetypes doesn't happen until you get into the feats and builds. Potential party roles like second-line fighter or skirmisher aren't suggested - surprising given previous tactical analysis elsewhere in Advanced Feats but the mentions of spiked armour and mithril bucklers are helpful tips for a magus to consider. Thirty feats for the magus widens the options for a magus and there is an additional section including magus-friendly feats from Complete Advanced Feats. There's still things for ordinary folks (Clever Maneouvering, Dancing Strike and Unbalancing Parry) as well. This is where Might of the Magus truly shines - it provides options for everyone but focusses on giving the magus more bang for their buck. Waiting until now to reference a certain albino sword-wielder was masterful restraint. The fey blade is a good choice of build. However the remaining two builds rely on multiclassing in addition to exercising archetypes in Ultimate Magic. Weapon choices and feat selection (e.g. give a Runefist Improved Unarmed Combat and Weapon Finesse: Spiked Gauntlet) to reproduce some benefits without sacrificing a level. Given the presence of the Ranged Spellstrike feat, a hexcrafter archer seems a logical showcase for it. Other builds suggest themselves on casual perusal. The cover from Christophe Swal shows a whipcracking magus in action with interior art reproducing the magus and adding sigil-style artwork involving swords, symbols and glyphs. 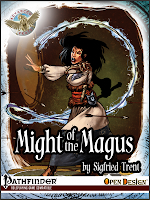 Might of the Magus is timed as a companion to Ultimate Magic so this feels a bit hurried in comparison with some Advanced Feats books like Cavalier's Creed. In comparison with other RPG PDFs, this is still quality stuff. In conclusion, Might of the Magus unpacks the magus class for Ultimate Magic in the same way the other Advanced Feat books do the Advanced Players' Guide base classes. While it relies on multiclassing to optimise builds, there isn't so much for the straight magus beyond the bladebound archetype which seems like a missed opportunity. It's still a good book and if you've got a player who wants to grasp the nettle of playing a combatant in light armour, this is a good choice for them.